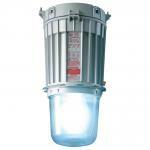 All versions can be used for HPS lamps as well as for MH lamps. The NVMV pendant light fittings can ideally be used for wall, ceiling or pole mounted installations in low or medium heights. Due to the high degree of protection and the large permissible ambient temperature range this series can be used for application with nearly all harsh and industrial conditions.